Banffshire & Buchan Coast MSP Stewart Stevenson has welcomed the announcement that the Scottish Government is to provide £200,000 to help Moray residents insulate their homes. The move is timed to coincide with the Scottish Government’s winter preparedness programme, and will be rolled out in the coming months. The fund is aimed at reducing household bills, improving energy efficiency and reducing fuel poverty, as energy prices continue to rise in the North and North-east. Meanwhile local Moray MP Angus Robertson, along with SNP colleagues at Westminster, is continuing to make the case for better regulation of energy prices and more action to help households struggling with soaring bills. “We need to make sure we are as prepared as possible for winter when it comes, and this new funding boost for Moray households will not only tackle fuel poverty this year, but will continue to drive down winter bills for years to come. “Price hikes from fuel companies continue to threaten homes across Scotland with fuel poverty, which has no place in this energy-rich nation. “In Moray alone it is estimated that around 8,000 homes could be in fuel poverty. While it is good news that the Scottish Government is doing what it can to help households use less energy the UK Government must also take action to tackle soaring prices. Over the next year, the £12.5 million Universal Home Insulation Scheme (UHIS) will be administered by local authorities to offer a range of free home insulation measures to improve energy efficiency and reduce fuel poverty. All those who use and enjoy Scotland's waters are being encouraged to take three sensible measures to tackle invasive non-native species and minimise their spread. "From the mountainous Highlands to our urban and industrial areas, Scotland has a diverse range of water habitats, which enrich the environment and provide fantastic opportunities for leisure activities - as I've seen for myself at Loch Leven today. They also make important economic and social contributions and are a boost for tourism. "However, the spread of invasive species are an increasing problem, which threatens native species and our aquatic ecosystems. Water users can unwittingly help the spread of these foreign invaders if they don't adhere to three simple steps - to check, clean and dry their equipment and clothing when leaving the water. "Once invasive species become established in Scotland, it is often very difficult and costly to remove them. Therefore it is in all our interests to apply these sensible measures to stop their spread in the first place and ensure that our burns, rivers, lochs, and canals continue to be such tranquil and beautiful locations for Scots and visitors alike to enjoy." "The Check, Clean, Dry campaign promotes simple but effective actions that will reduce the risk of introduction and spread of invasive non-native species that are a significant and growing threat to Scotland's rivers and lochs and the economically important resources they support. "The Rivers and Fisheries Trusts of Scotland (RAFTS) look forward to working closely with the Scottish Government, government agencies, its member Trusts and their professional and volunteer networks to help promote this campaign." "It's important for all of us to be aware of the threats to our rivers and lochs posed by non-native species, and understand how we can play a part in stopping their spread. Similar long-term campaigns in New Zealand and the USA have made a real difference. These simple precautions will be vital in keeping the zebra mussel and curly waterweed from spreading further in Scotland, as well as species we thankfully don't have, such as the killer shrimp, from reaching here." Stewart Stevenson launched the 'Check, Clean, Dry' (part of a UK-wide campaign) at the Loch Leven National Nature Reserve in Kinross. The target audience are all water users and the campaign is designed to raise awareness and encourage responsible behaviours that minimise the risk of entry and spread of aquatic invasive non-native species. The Scottish campaign is focused on both stopping the spread of any invasive non-natives species into Scottish waters and minimising the impact of any that are already found here. Examples include the Zebra Mussel (from the Black, Caspian and Aral Seas), of which there have been a few recorded findings of in the Forth and Clyde canal system. The New Zealand Pigmyweed has been found in Scotland but is not widespread - the species grows in dense mats that restrict native species. Scotland is so far free of the 'Killer Shrimp' from the Caspian region in Eastern Europe, which has been found in England and Wales. This aggressive species is listed in the 'Top 100 worst alien species in Europe' and specimens are known to be able to survive for up to 15 days on damp material - underlining the importance of the Check, Clean, Dry campaign. Banffshire & Buchan Coast MSP Stewart Stevenson paid a visit to Ordiquhill School near Cornhill on Friday to talk to Primary seven pupils who did a project on “World of Work”. The MSP talked about his job in the Scottish Parliament and then faced a grilling from pupils at the Banffshire school. “It is always a joy visiting schools within my constituency and as the pupils had tackled a World of Work project, I described to them a typical week for me covering what happens in the Parliament and constituency engagements. “I was impressed by the genuine interest the children had and the range of questions asked about my role as MSP for Banffshire & Buchan Coast. Banffshire & Buchan Coast MSP Stewart Stevenson has received assurances from Royal Mail bosses after raising concerns about the standard of service being experienced by local people using the Port Office outreach service provided at Rothiemay. Complaints were received regarding the electronic equipment used by the outreach service which has proved to be unreliable, reportedly leaving customers without cash on occasions. The SNP MSP has taken action after being visited by constituents on the matter at his recent surgery in the village which was part of his summer tour of smaller communities. “Royal Mail senior management have explained the background to the recent technology issues affecting their equipment in Rothiemay and have restated their commitment to their customers there. 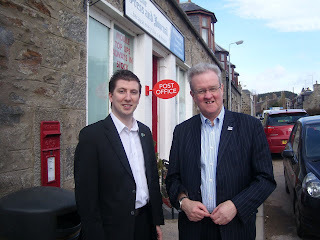 “It was clear to me from the comments made by my constituents that the Post Office staff involved were doing their best under difficult circumstances and absolutely no criticism was aimed at them, which I think underlines the high regard people in Rothiemay have for their counter service. “Unfortunately all businesses suffer occasional failures, but we have robust processes in place to quickly identify the root cause of the fault and to rectify them as quickly as possible." Mr McKay added that an intermittent fault which affected the fixed communications line and the wireless router, which acts as a back-up, was reported to an engineer and was fixed quickly. The first successful recipients of the Commonwealth Saltire Professional Fellowship from Kenya and Ghana are visiting Scotland as part of a scheme to share expertise on the impacts of climate change. As part of the varied trip programme, the six Fellows met Climate Change Minister Stewart Stevenson after being invited to First Minister's Questions. As part of the 2014 Commonwealth Games bid commitment, the Commonwealth Scholarship Commission introduced a series of awards to allow key mid-career professionals from Commonwealth countries to undertake short term Fellowships with relevant organisations in Scotland. "This is an excellent opportunity for expertise and knowledge to be shared throughout Commonwealth nations, particularly with those countries most vulnerable to the impacts of climate change. I trust that our visitors from Kenya and Ghana will gain insights from their time in Scotland on our climate change efforts, in the same way we can learn from them. "It's sensible that while we celebrate an event such as the Commonwealth Games coming to Scotland, we use these opportunities to address the more solemn matters facing our nations. Sharing knowledge and skills in an international arena is the best way we can all hope to win the race against climate change." "The Glasgow 2014 Commonwealth Games offer vast opportunities to put Scotland on the path to a healthier and more successful future. And as a government we want to deliver a legacy that is both ambitious and will capitalise on this once in a generation opportunity of hosting a major international sporting event in the heart of Scotland. "I congratulate these first successful applicants to the fellowship scheme. As well as fulfilling one of the key host nation bid requirements, this initiative will ensure a green games legacy by sharing best practice with Commonwealth nations most vulnerable to the effects of climate change." The Commonwealth Saltire Professional Fellowships on Climate Change were introduced to meet the Glasgow 2014 commitment to set up a carbon emissions reductions fund. Banffshire & Buchan Coast MSP Stewart Stevenson has welcomed the confirmation in John Swinney’s speech on the Scottish Government’s Spending Review that the Scottish Government remains committed to the construction of a replacement prison for Peterhead. The speech also confirmed a continued commitment to deliver the AWPR and upgrade of the A90 between Balmedie and Tipperty. “The SNP has long been determined to deliver a much needed replacement prison in Peterhead and I know it will be extremely welcome news to prison officers and others in the area that the Scottish Government’s commitment to this project remains undimmed. “The current facilities at Peterhead Prison are simply not acceptable for a modern prison system and the need for a new prison is beyond question. Confirmation that it will proceed is good news for Banffshire & Buchan Coast. The modernisation of Scotland's vital crofting sector has taken an 'important step forward' with the second phase of the Act's commencement. Place duties on tenant and owner-occupied crofters to occupy and work their crofts, to be enforced by the Commission, from 1 October 2011. "In 2010, the Scottish Parliament chose to take action to change a failing system and put in place measures that will deliver growth for our crofting sector and build stronger communities. "Through having land held in crofting tenure and through making crofts available to people who are willing to make a permanent contribution to these communities by living there and working the land, crofting can once again be a model for sustainable rural development. "The Scottish Government is presently consulting on Crofting Commission elections. The new Commission will be democratically accountable and will reflect and respond to concerns of crofters. This order will enable that." Banffshire & Buchan Coast MSP Stewart Stevenson has welcomed the announcement that the big Lottery Fund is set to provide funds to a number of community groups in the constituency under the Awards for All scheme. St Fergus Community Association has been awarded £10,000 to erect fencing and gates around the newly surfaced multi-use games area at St Fergus Community Park, helping to provide a more distinct area for games. Light up Peterhead has been awarded £8,810 to upgrade their winter light displays to more eco-friendly LED systems, reducing power consumption, maintenance and replacement costs. This will make the carbon footprint of the community event more sustainable. Additionally, Aberchirder School has been granted £7,500 to install an obstacle course in the playground, providing more exciting facilities for pupils at the school to use. “I am delighted that to hear that these community projects in Banffshire & Buchan Coast are in line for funding thanks to the Big Lottery Fund. “Moving to an LED lighting system for Peterhead’s winter light display will be enormously helpful in reducing the costs for the display while at the same time are a small but important step in efforts to tackle climate change. “I know that pupils at Aberchirder School will be excited about the new facilities in their playground, although their parents may not be as thrilled if it means they have to wash clothes more often! “Meanwhile the fencing for the games area at St Fergus Community Park will no doubt add to the work that has already been done and help to encourage more people to use the facilities on offer. Scotland's bathing water season got off to a really good start in the early weeks and, despite wet weather sweeping much the country later in July and August, by the end of summer our bathing waters overall achieved a similar number of passes to last year but also had notable progress at some locations. Monitoring results released today by the Scottish Environment Protection Agency (SEPA) show that 95% of Scotland's bathing waters finished the season having achieved "mandatory" bathing water quality or better, and overall only 1.7% of samples were below European standards. Nearly half of Scotland's 83 official bathing waters (48%, 40 in total), met the more stringent 'guideline' standard for water quality. Results for individual beaches can be found on SEPA's website. Relatively sunny, and mostly dry weather, for May and June meant that initial bathing water quality was good but, as in previous years, torrential rain did result in some later failing samples. Four bathing waters failed for the season; Lossiemouth East, Sandyhills, Irvine and Eyemouth. It is widely accepted that Scotland's changeable weather patterns and heavy summer rains can have a deleterious impact on water quality. SEPA and our partner organisations shall continue working towards reducing the causes of poor bathing water, such as agricultural run-off and overflows from drains, but we are also giving the public much better information about water quality to allow them to make informed choices. This year SEPA expanded the daily prediction and signage system with 12 new beach message signs and the launch of a trial smart phone app. This season was amongst the best yet for the accuracy of our bathing water predictions and advisory notices. On over 99% of days the daily advice given to the public was correct or precautionary and we correctly predicted 85% of poor samples at locations with bathing water signs. Official profiles for each bathing water, available on the SEPA website, also give information as to which bathing waters are at risk of poor water quality after heavy rainfall. From next season this information will also be posted, as required by the revised Bathing Water Directive, on signage at all beach locations. "Whilst it is always disappointing to see any failed water quality sample, this season's success stories should also be celebrated. Monifeith, which was a new location added this year after being put forward for designation with strong local community support, achieved a clear guideline status. Also Ettrick Bay on Bute, for years one of our worst-performing bathing waters, comfortably passed and indeed was only two results short of meeting the more stringent guideline standard." "Good water quality is important for our bathing waters. Clean, safe beaches are essential to tourism and the leisure pursuits of the people of Scotland, which provide valuable income to many seaside communities. It is good to see our world-leading electronic message signs continue to provide accurate information, to beach users, on the quality of the bathing water." A map published today, which shows all of the greenspace in urban Scotland, is a world first. No other country has mapped its greenspace in this way. Scotland’s Greenspace Map brings together greenspace data from all 32 Scottish local authorities to show the location and type of all of our urban greenspaces – our parks, playing fields, allotments, play areas and gardens. For the first time, information about all of the open spaces in Scotland is available in one place. This means we can now provide a definitive answer to the question of how much greenspace do we have in urban Scotland? 1,112 square kilometres - that’s equivalent to nearly 160,000 football pitches. Or to put it in a more Scottish context, if we combined all of our urban parks, play areas, allotments and gardens, they would cover an area twenty times the size of Loch Ness! This Map also provides a baseline. Future updates mean we will be able to track changes in the amount and type of greenspace. Scotland’s Greenspace Map is available as a public view interactive map. Using place names or postcodes, users can search the map and use simple navigation and zoom tools to find out about the extent and type of greenspace in their area. For professional users, who need to interrogate and analyse the data, the Map is available as Geographic Information System (GIS) data. The development of Scotland’s Greenspace Map was led by greenspace scotland with funding support from Scottish Government, Scottish Natural Heritage (SNH) and Forestry Commission Scotland. The Map was made possible through the support of all 32 Scottish local authorities. “It is vital that Scotland remains at the forefront of innovation on environmental planning and policy if we are to remain an attractive and environmentally progressive place to live and work. "We have an amazing variety of parks and public gardens in Scotland - and with Scotland's Greenspace Map, anyone can now easily find every single one of them. Getting out and enjoying nature, even if it is just popping across to a small park across the road, is so important to our health and wellbeing. Greenspaces also contribute to a healthy environment and to our economic development. Gathering all the information necessary for this map was a huge undertaking, which we were delighted to help fund, as the map will be useful to the public, as well as to help councils develop planning and environmental policy." After nearly quarter of a century, the SNP Constituency Office which has served as a base for the area’s Parliamentarians is moving home. The office, based in Maiden Street, has moved to more modern, serviced accommodation at Peterhead’s Burnside Business Centre, just off South Road. The move has been welcomed by staff and Parliamentarians as it will mean a more professional environment for dealing with constituency casework and meeting with constituents. “I’m delighted we have secured new premises at the Enterprise North-east Burnside Business Centre. “Maiden Street has been my base for over ten years and we have steadily been reaching the point where our office accommodation there has become less and less suitable both in terms of workspace and the environment needed to work with modern IT equipment. “This move will allow Stewart and myself to work together more effectively. We already share some staff and resources and sharing the same building will lead to greater efficiencies. “In addition, I’m pleased to announce that the public opening hours of both offices will be extended by an extra ten hours per week in order to increase our availability to constituents. “17 Maiden Street has been the Constituency Office since 1987 and during that time thousands of cases and issues have been dealt with here. Many of the staff who have worked in Maiden Street have gone on to much greater things. Former Office Manager, Richard Lochhead, is now in his second term as Cabinet Secretary for Rural Affairs and Fisheries in a majority SNP Government. The first Office Manager, Peter Murrell, is now Chief Executive of the SNP. Minister for Learning & Skills and Western Isles MSP Alasdair Allan had two spells working in Peterhead while newly-elected Regional MSP for Glasgow Humza Yousaf spent a summer working in Maiden Street getting political experience which stood him in good stead for his new role. “The range of issues dealt with in the normal course of a week in Maiden Street was staggering. “A lot of the issues people seek assistance with are what you would expect, such as housing and benefits. Benefits in particular is a difficult issue at the moment because of the changes being introduced by the Tory Government in London. In that respect, I suppose things haven’t changed a lot since the Constituency Office opened in 1987 as we had a Tory Government then too which seemed intent on punishing the most vulnerable sections of society. “I always say however that you are can never be sure who is going to phone or come through the door or what issue you will have to deal with next. “Trying to save factories from closure is not something that most MPs will tackle, probably through fear of being associated with failure. With Alex Salmond however, we found ourselves doing exactly that and, against the odds more often than not, managing to get a result. “For example, Buchan Meat in Turriff went under just at the time when the public were getting concerned about BSE and the meat industry was facing a crisis. The prospect of saving the factory, let alone persuading anyone to take it over looked remote. But through working with the employees and trades unions, as well as highlighting the plight of the factory in the House of Commons, we ended up with two or three companies bidding to take over Buchan Meat with Kepak ultimately being successful. Today, Buchan Meat continues in Turriff in the shape of Woodhead Bros who supply Morrisons Supermarkets. “The Simmers of Hatton factory is another good example of how local jobs were saved through tough negotiating with a multinational firm which allowed a local company to step in. “The Sapphire Campaign, which resulted in the bodies of the four crew members lost at sea being returned to their families for Christian burial is also something that I will never forget. It was very humbling to be a part of that and to help the bereaved families achieve their dearest wish. “Maiden Street was also the nerve centre of various political campaigns as well, including both of Alex’s leadership elections in 1990 and 2004, and the 2001 by-election which saw Stewart Stevenson elected as local MSP. There’s quite a bit of history been made within that building. Chairman of the Scottish Wildlife Trust Allan Bantick will join Minister for the Environment Stewart Stevenson to present Scotland’s first ever Biodiversity Benchmark awards. Aggregate Industries will receive the prestigious award for their work protecting nature on Powmyre Quarry, on the Strathmore Estate at Glamis and Duntilland Quarry near Shotts in North Lanarkshire. The award recognises that a company has reached a certain level protecting the biodiversity around them. Mr. Bantick will be representing the Royal Society of Wildlife Trusts- the umbrella body for the 47 Wildlife Trusts in the United Kingdom, at the event at Powmyre Quarry on Tuesday 13th September. “It gives me great pleasure to congratulate Aggregate Industries on achieving The Wildlife Trusts' Biodiversity Benchmark award for their work at Powmyre and Duntilland. “The Biodiversity Benchmark is the leading award for business that recognises and rewards continual biodiversity improvement. “Aggregate Industries have worked hard to protect the natural world in and around two important sites. “It is important for all businesses to think at how they can protect and enhance the natural world - it makes good business sense and it is the responsible thing to do. I hope others will follow Aggregate Industries' example." “I am delighted to present Scotland’s first Biodiversity Benchmark award to Aggregate Industries for their good work in encouraging wildlife to flourish in quarries through tree planting and wetland development. It is encouraging to see the contribution that one company can make to preserving the natural environment and I hope this provides an inspiration to others. Banffshire & Buchan Coast MSP Stewart Stevenson has given his backing to ‘'Know Your Numbers!' Week, which takes place from 12th - 18th September. “Organised by the Blood Pressure Association, Know Your Numbers Week is designed to educate about the health complications associated with high blood pressure. It's also about encouraging us to monitor our blood pressure. “High blood pressure is the silent killer with 1 in 3 people with high blood pressure not realising they have it because it has no obvious symptoms. “Keeping blood pressure at a healthy level is one of the most important things everyone can do to reduce these major causes of death and disability – and this can only be done if everyone gets tested to know their blood pressure numbers. Banffshire & Buchan Coast MSP Stewart Stevenson has raised concerns about the standard of service being experienced by local people using the Post Office outreach service provided at Rothiemay. "At the outset, I want to be clear that my constituents had nothing but praise for the staff who operate the Post Office outreach service in Rothiemay and they do not attach any blame to them, who are doing their best under very trying circumstances. "The problem seems to be the equipment which Post Office Limited has supplied for use in the outreach services is unreliable, leaving customers unable to access their cash as the electronic system regularly fails. "I have taken this up with senior Post Office management in Edinburgh seeking a resolution as we cannot have a situation where, having closed the Post Office counter in the village on the promise of an outreach service, we now find that service is not up to scratch. "I have asked them to look at the system used by the mobile banks which doesn't rely at all on electronic systems and seems to be working perfectly well." SNP MSP for Banffshire & Buchan Coast and Minister for the Environment & Climate Change Stewart Stevenson has welcomed the setting out yesterday of the Scottish Government's program for the coming Parliamentary term. The various measures outlined seek to distance the Scottish Government from the Tory-led London Government, with policies on jobs and growth, rather than cuts as a means out of the current economic difficulty. First Minister Alex Salmond, said his Government was 'Thinking Big' for Scotland as he urged MSP to support the plans. "The Scottish Government's plans will further develop and promote growth and confidence in Scotland. "The effectiveness of this strategy is evident in recent figures showing an improved picture for employment levels in Scotland compared with that of the UK. "Central to Scotland's continued development must be growth in jobs, a measure the Scottish Government aims to continue delivering upon. "Additional measures to maintain capital investment, support Scottish exporters, help small businesses and tackle youth unemployment will combine to sustain jobs and build confidence in a dynamic Scottish economy going forward. "An exceptionally important element of the Scottish Government's plan is the elimination youth unemployment with the 'Opportunities for All' plan. "This will see all 16-19 year olds find learning or training opportunities to enable them to contribute to the export and manufacturing driven economy that is Scotland's future." Greenhouse gas emissions in Scotland have fallen by 28.9 per cent since 1990, according to latest official statistics published today. The 2009 figures show a seven per cent reduction between 2008 and 2009, with total emissions falling from 54.8 million tonnes CO2 equivalent in 2008 to 51.0 in 2009. Taking emissions trading into account, Scotland's emissions have fallen by 27.6 per cent since the 1990 base year, meaning that Scotland is well on the way to achieving its 2020 target of reducing emissions by 42 per cent. "These figures demonstrate continued progress towards achieving our world leading climate change targets. "Whether public sector, private companies or households, we all need to play our part in delivering a low carbon Scotland which will continue to see greenhouse gas emissions fall. "As encouraging as these results are, we must not be complacent about meeting our targets, as events like the recent severe winters may have an impact on our emissions in future years. "The challenge for Scotland therefore remains to find ever more innovative ways to drive down emissions, while creating a more sustainable, low carbon economy for Scotland." The annual report on greenhouse gas emissions data for all four countries of the UK for 1990, 1995, 1998-2009 produced for the Scottish Government, Department of Energy and Climate Change and the other devolved administrations by AEA Ltd is also being published today. Targets in the Climate Change (Scotland) Act 2009 and the Government's Economic Strategy Sustainability Purpose targets, are set out in terms of net emissions. Net emissions, are calculated by adjusting total emissions for the carbon sink contained in land use and forestry sectors as well as the effect of emissions trading in the European Union Emissions Trading System. The Scottish Government has today (Monday) published its next batch of annual emissions reduction targets. The draft Order, laid in parliament today, will set targets for 2023-2027, building on the world-leading Climate Change (Scotland) Act and its targets to reduce greenhouse gas emissions by 42 per cent by 2020, and 80 per cent by 2050. "These proposed targets extend and strengthen the pathway to meeting Scotland’s Climate Change aspirations. This sends a clear signal about the Scottish Government’s long-term commitment to the low carbon agenda.